The uncomplicated exteriors of this Cape Provencal country house give little hint of the magnificently opulent interiors of this five-star boutique hotel. From its chequered marble floors, to its cathedral-style ceilings, luxurious fabrics, period antiques and resplendent crystal chandeliers La Residence is an exceptionally romantic and indulgent paradise. 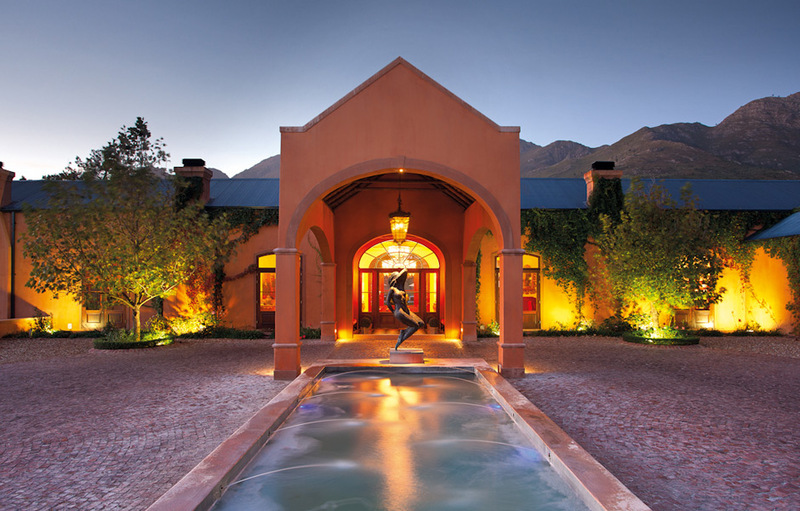 Situated on a 30-acre estate in the Franschhoek Valley, surrounded by vineyards, plum orchards, and fragrant gardens which are overflowing with colourful flowers and herbs, La Residence is a haven of luxurious accommodation, fine dining and total relaxation. On lazy summer days guests can recline alongside a shimmering infinity pool or de-stress with pampering treatments in the Spa. If you’re energetic the air-conditioned gym has all the latest hi-tech equipment. The royally appointed dining room invites guests to enjoy a leisurely and memorable culinary experience. 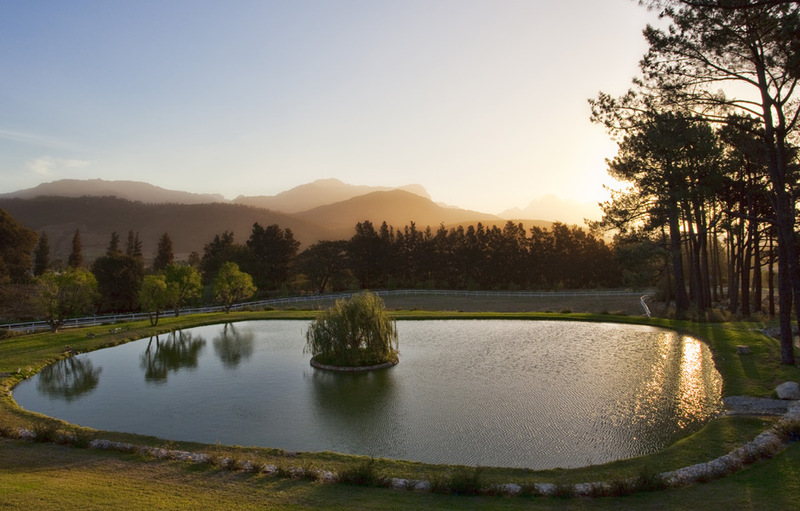 Sumptuous meals prepared from the freshest produce from the estate’s bountiful gardens are paired with the finest local wines. Hand-crafted cheeses such as Chevin, Boeren Kaas, superb local Gruyere, drunken Pecorino and the creamiest Blue Cheeses are locally sourced and served with home-made preserves and breads baked in La Residences ovens. Persian Alley invites guests to unwind in a typically French salon environment with soft white wicker furniture on a selection of gorgeous original Persian rugs. The lounge with its large and inviting fireplace is the perfect repose after dinner. While there is no on-site Spa, La Residence uses a network of highly qualified and skilled external therapists to cater to your individual needs. Whole-body therapies are available and guests can enjoy treatments in their rooms or on their private balconies. 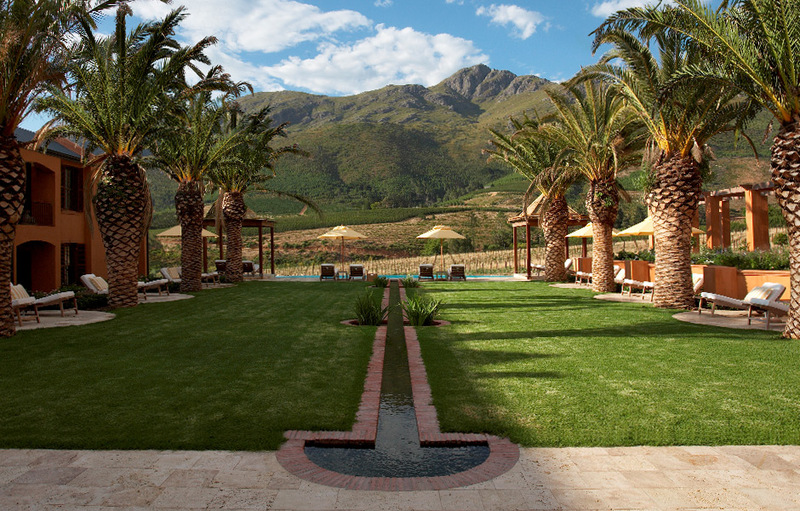 Guests have a choice of 11 spacious and opulent bedrooms with magnificent en-suite bathrooms. La Residence is the kind of hotel, where you come back time and again and try out the different suites just to be able to choose a favourite. The suites open onto generous sunny balconies and verandas. Each of the suites is individually decorated with ornate antiques, plush Persian carpets and an eclectic mix of artworks. 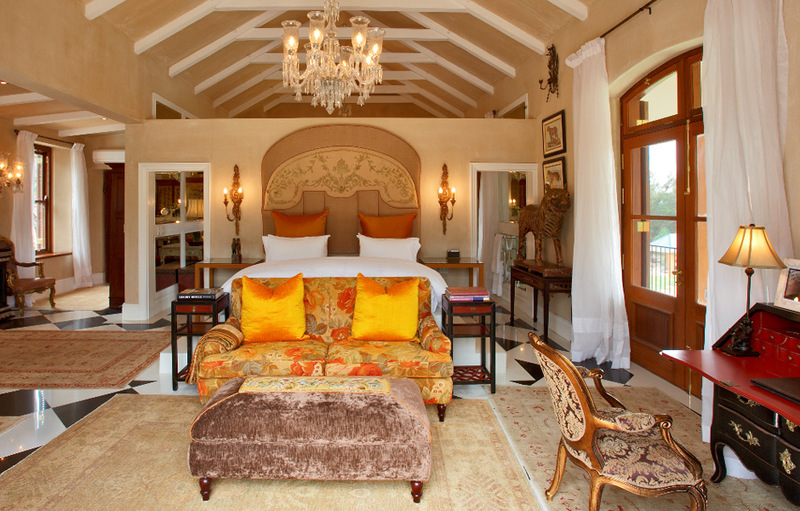 With burnished orange silk drapes, mink walls ornate antique furnishings and a stunning four-poster bed, the Honeysuckle Suite is a truly romantic destination. The en-suite marble bathroom features a relaxing roll-top bath and drop-tear chandelier. Resplendent reds and moss greens dominate this regal room. There is a distinct Asian influence in its elaborate bathroom mirrors and flamboyant Persian rugs. The enormous en-suite bathroom features his and hers basins, a luxurious roll-top bath and a russet couch. Taking its colour scheme from the heavenly scented, delicate flowers this suite features a marble columned four-poster bed and Louis IV style furnishings. The spacious en-suite bathroom and dressing room is breathtaking and as well appointed as the master bedroom, from its marble floors to its roll top bath and his and hers vanities no aspect has been forgotten. Vivid verdant greens and cerise pinks, lovely high ceilings and large picture windows compliment the airy atmosphere in this uplifting suite. Gorgeous Persian rugs line the floors and soft white linens adorn the oversized four-poster bed. The delicate chandelier in the en-suite bathroom cast warm light across cosy bathroom with his and hers vanities. Filled with tapestries depicting ancient Tibetan times this luxurious suite is decorated in ravishing reds and vermillion. High ceilings in the en-suite bathroom add to the spacious feel and the roll-top bath is an idyllic repose at the end of the day. 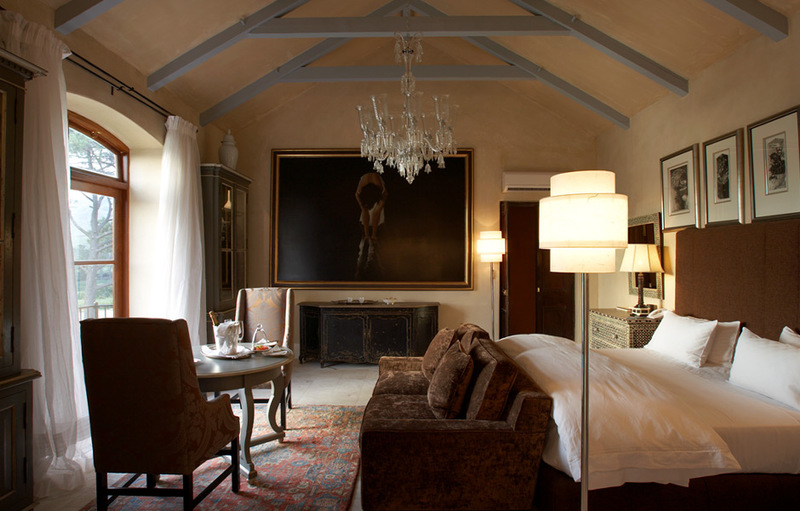 Named for the Huguenots who populated the Franschhoek countryside in 1688, this suite has stunning high ceilings with exposed beams and an abundance of space. Soft golds and yellows give the room a light and airy feel. 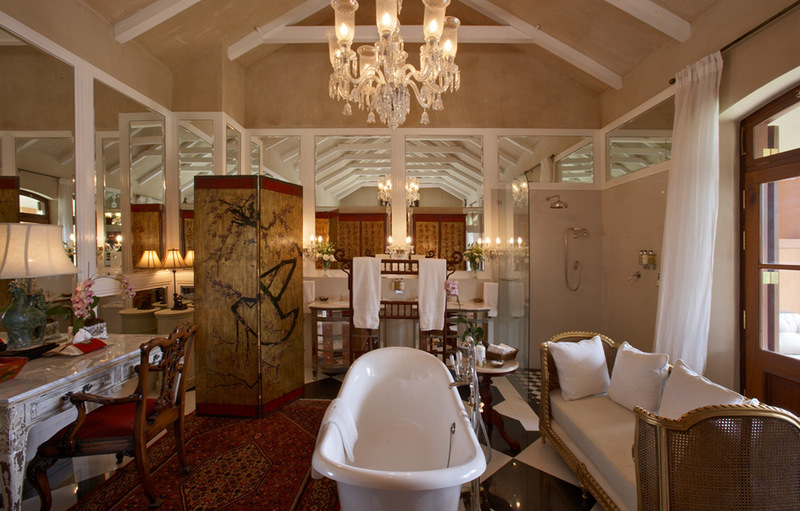 The lavish en-suite has his and hers vanities and a free standing roll-top bath high ceilings with exposed trusses and a whimsical filigree chandelier. The more contemporary gorgeous Hibiscus suite has splendid splashes of coral pink and framed paintings of the flowers after which the room was named. The room is bathed in the most luminous light from the glowing chandelier. The en-suite bathroom is inviting and features his and hers vanities and stunning French doors which open onto lush gardens. As the name suggests the primary colour in this typically French boudoir is a byzantine blue softly offset by gentle greens and luxurious Persian carpets. The room has a more masculine feel than the rest of the rooms in the hotel and the en-suite is tastefully decorated in pale Parisian blues and gold. Also tending to the masculine with its rich browns and darker finishes, this suite invites you to linger longer in your oversized bed and take in the magnificent scenery through large French doors that open onto the gardens. The large en-suite bathroom with dressing room is bewitching and airy and features his and hers basins and a roll top bath and a shimmering wall of mirrors which accentuates the spaciousness of the room. This pretty and cheeky suite comes with a small library and is beautifully appointed with ornate furniture and a large comfy sofa. This suite is more modern that the other suites and oozes warmth and comfort. The spacious en-suite bathroom has his and hers basins and gorgeous taupe and blue Persian rugs with French doors offering splendid garden views from the porcelain roll-top bath. Delivering the ultimate experience in luxury and opulence, the splendid Maharani Suite is the largest of the suites on offer and features high ceilings with exposed trusses large picture windows and French doors leading out onto two balconies – one overlooking the lawns and pond and the other facing an olive grove and the mountains. Gorgeous reds and golden yellows and a selection of large Indian paintings and crystal wall-sconces add to the lush atmosphere. The raised bed incorporates a padded headboard made from exquisite antique fabric. The lavishly decorated bathroom has a chequered marble floor, roll-top bath and his and hers vanities. A short walk from the hotel brings you to the five La Residence Villas which offer spacious accommodation in a variety of configurations which sleep up to 20 guests, perfect for groups and families staying on the Estate. Stylishly appointed, these suites have separate dining and lounge areas, and luxurious bathrooms with marble en-suite bathrooms. All feature private terraces and gardens and four have their own pools. Complimentary drinks and snacks, wide screen televisions and DVD players create a homely feel. Guests may dine in their villas or the central Terrace Room. Bedrooms are decorated in vibrant reds, blues, purples, yellows and greens invigorating your senses and lifting your senses. While still furnished with beautiful antiques there is definitely more of a contemporary feel to the Villas.